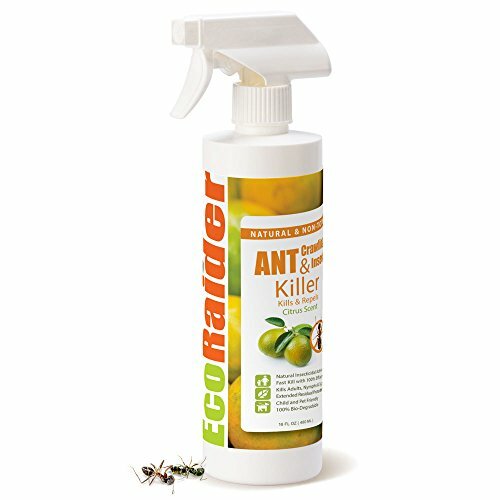 Ecoraider natural & non-toxic ant & crawling insect killer quickly eliminates invasive household insects without using synthetic pesticide toxins. It has a pleasant citrus scent and may be used both indoor and outdoor. Ecoraider's active ingredients are organically extracted and enhanced botanical insecticidal compounds which are similar to essential oils. It is based on the patented technology platform of the "1 effective bio-insecticide for bed bugs " as named by entomological society of america. With a unique mode of action, ecoraider is effective on even pesticide resistant insect populations. Its micro-scale particles of active ingredients penetrate exoskeleton and attack a neuron receptor that only exists in invertebrates to cause quick paralysis and death of the insect. Ecoraider's effectiveness is lab-and-field-proven. Study from purdue university confirmed that it kills 100% of tested ants within 1 minute. Not only ecoraider kills fast, it also breaks down ants' trailing activity and prevent them from re-grouping and re-entry of the treated area. Study results from the USDA invasive insect lab confirms its efficacy in killing ticks with extended residual. In addition, ecoraider also effectively kills beetles, crickets, dermestids, fleas, flies, gnats, lice, midges, millipedes, mites, moths, silverfish, spiders, springtails, stink bugs and many other pests. As lethal as it is to pests, ecoraider only uses ingredients in compliance with FDA gras standards. It is categorized by the epa as a minimum risk pest control product and exempt from registration. It is safe to use around children, pets, birds and fish. Kills 100% of ants within 1 minute, it also breaks down ants' trail and prevent from re-grouping and re-entry for 4 weeks or longer. If you have any questions about this product by EcoRaider, contact us by completing and submitting the form below. If you are looking for a specif part number, please include it with your message.